May 2012 – on my way: make it someday. It has been ages since I’ve posted about cooking on here. Like, I am pretty sure I have aged since then. But! It doesn’t mean that I haven’t been cooking. I have been cooking, and baking, and eating. I’m still really into soup. I’ve also been on an asparagus bender, because, well, it’s spring! This here, though, this is a recipe that I made up myself, and I’m so excited that I had to share. As I contemplate moving away from Eugene, I’m looking at all my belongings: costume items that I’ll send back to the thrift store, books sitting on the shelf that I’d like to read before transporting them back to New Hampshire, this giant desk that I will have to somehow sell… and random food in the cupboards. I’m looking at you, five-pound bag of masa flour. Conveniently, about the time I remembered that I should probably use it up, it was Cinco de Mayo. I’m not sure I’ve ever celebrated Cinco de Mayo in any serious way, but I was determined to start. Well, sort of determined. I wanted to use up that masa flour, and to drink margaritas. So I talked to my friends Brian and Andrea. Andrea, you see, had just broken her ankle. She was on some pretty powerful painkillers, so she wouldn’t be able to have any tequila, but I tried to think of a way we could celebrate the holiday in a sedentary fashion. So I thought and thought and thought, and wished I had a tortilla press, and thought some more, and thought: stuff them! I cooked up some onions, green chiles, carrots, cheese, and tomatos, and then we sat around the table on the porch making masa cakes. Brian drank beer and Andrea propped her leg up on a chair, and was disappointingly non-loopy. It was a beautiful, beautiful afternoon – it’s finally spring in the most glorious of senses – and we grabbed blobs of the masa/flour paste and kneaded them with our hands. Then we shaped them into a ball, flattened the ball, dumped some filling on top, and folded the masa over and sealed the edged. Like a hand-pie. Made of masa. This makes it sound easy. It wasn’t hard, exactly, but it was messy. And at first, we stuffed too much filling inside the cakes. Then we tried to make them into balls instead of turnovers. By the time we settled on a form that didn’t fall apart or leak, there was masa everywhere. We headed inside, where Brian fried up the cakes in some oil while Andrea read out loud from an Amy Sedaris book. My favorite was the part about the mouse ghetto. 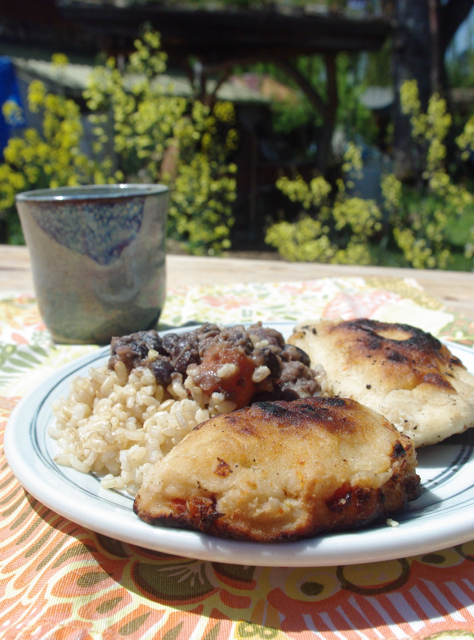 Anyway, we sat out on the porch, eating beans and rice, avocado and lime, and masa cakes. It was perfect. The cakes were delicious. Then we joined a few more friends for margaritas and Trivial Pursuit, girls vs. boys. Girls rule boys drool. It wasn’t a crazy Cinco de Mayo, but it was a happy one, spent with good friends. And we didn’t make authentic Mexican food, but we made food with Mexican ingredients – isn’t that what America does? This makes about 12 to 15 cakes, depending on how big you make them. You have to sort of wing it on the ratio of filling to masa dough. It’s very easy to make more dough if you have leftover filling, or you can put the filling in an omelette, where it is also quite tasty. Start by roasting the peppers. Set your oven to broil and place the peppers on a lightly oiled baking sheet, rolling them around to coat with a thin layer of oil. Place the pan in the oven and cook until the skin on the peppers begins to blister. Roll the peppers so a new side is facing the broiler element, and repeat. Most peppers have three flattish sides, and make sure that each begins to blister. Then pull the pan out of the oven. The skin should peel off of the peppers easily; make sure that you have it all off. Chop of the tops of the peppers, slice in half lengthwise, and scrape out the seeds. Chop into small pieces and place in a bowl. In a frying pan, heat the oil. Add the chopped onion and garlic and cook for a minute; add the carrots, salt and pepper, and spices. You can make the filling quite flavorful as only a small amount will be in each masa cake. Cook until the carrots are soft, then add to the bowl with the chiles. Chop the tomato and add it to the bowl, then shred the cheese over everything and stir to combine. In a larger bowl, place the masa and add water, stirring, until a dry dough forms. Take a ball of dough the size of a lemon and knead it in your hands for a few minutes. When it is more cohesive and pliable and seems strong, shape it into a ball, then flatten that ball on the countertop. Pick it up and use your palms and fingers to make it as thin as possible without ripping. Place back on the countertop, and spoon some filling into the middle, just to one side of an imaginary center dividing line on the disk of dough. Fold the edge of the disk together, crimp them, and place on a plate or baking sheet. Repeat until there is no more dough. In a frying pan, heat 1/4 inch of oil until it shimmers. If there is not enough oil, the cakes will stick to the bottom of the pan and fall apart. Fry the cakes, flipping from side to side carefully, until golden all over and dark brown at the roundest parts. Dry on a stack of paper towels to remove some oil. Serve with slivers of lime to squeeze over the masa cakes, condiments, and, if you’re like me, back beans and rice.